16th meeting of the Financial Stability and Development Council (FSDC) was held in New Delhi. This meeting was chaired by Arun Jaitley (Union Finance Minister). 1st Braille library in Guwahati opened at the Blind High School on the occasion of World Braille Day (4th January). 1st edition of ABU (Asia Pacific Broadcasting Union) International Television Dance Festival was held in Hyderabad (Telangana). 2nd edition of Ministry of External Affairs’ annual Raisina Dialogue was held in New Delhi. 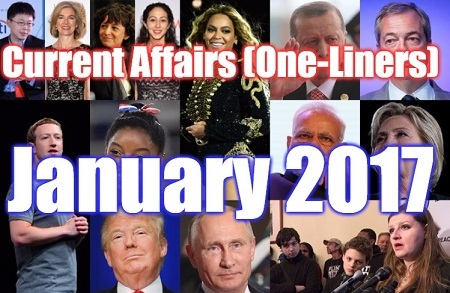 This year's Theme : “The New Normal: Multilateralism in a multipolar world”. African Union today re-admitted Morocco "back into the family" after a 33-year absence as 39 out of 54 member states voted in favour of its return at the 28th African leader's summit in Ethiopia. Note : Morocco left AU in 1984 after it recognised the independence of Moroccan-occupied Western Sahara. 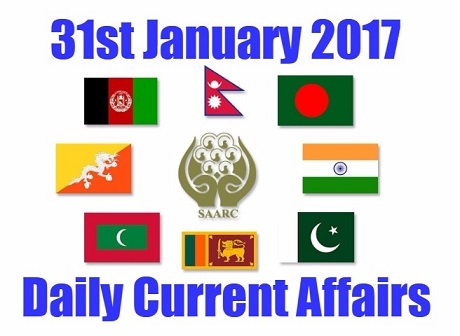 Representatives of the South Asian Association for Regional Cooperation (SAARC) will meet in Nepal on February 1-2 to attend a session of the Programming Committee. This will be their first meeting since the postponement of the SAARC Summit which was to take place in Pakistan last year. 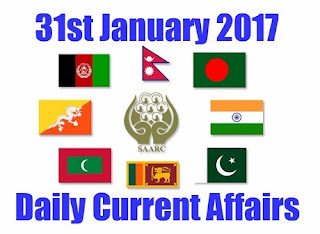 The members will reportedly discuss the SAARC Secretariat's budget among other issues. Pakistan has declined an invitation by the Indian Parliament and the Inter-Parliamentary Union to attend South Asian Speakers' Summit to be held in Indore next month. The summit will be attended by Speakers of Parliament from Afghanistan, Bangladesh, Bhutan and Sri Lanka among other countries. Note : India had boycotted a Commonwealth Parliamentary Union meeting in Islamabad in 2015. Ahead of the Union Budget tomorrow, the Union finance minister Arun Jaitley today tabled the Economic Survey 2016-17 in Parliament budget session. 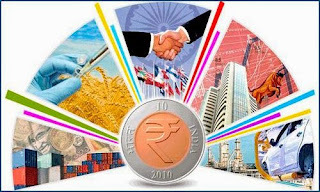 The Economic Survey reviews the developments in the Indian economy over the previous 12 months, summarizes the performance on major development programmes, and highlights the policy initiatives of the government and the prospects of the economy in the short to medium term. The survey projects the economy to grow in the range of 6.75% to 7.25% in the next fiscal year 2017-18 in the post-demonetisation year. Here are the major highlights of the survey.